Submitted by The Amethyst Dragon on 2014-07-20 13:33. 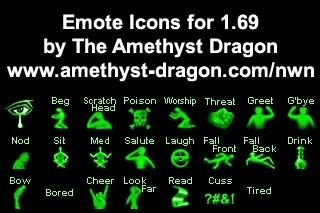 Not wanting to disappoint anyone, here are new icons for your emote radial menu! These are colorized (green), with a little text, a small picture, and they work with my Transparent GUI.